Weevils are among the most destructive insects on the planet. The Boll Weevil is certainly one of the most famous of all insects, devastating the U.S. cotton crop in the 1920s. There are over 35,000 species of weevil, with more than 2,500 species in the United States and Canada alone. All are strictly herbivorous. The mouthparts of snout beetles are modified into down-curved snouts, or beaks, adapted for boring into plants; the jaws are at the end of the snout. The bent antennae usually project from the middle of the snout. 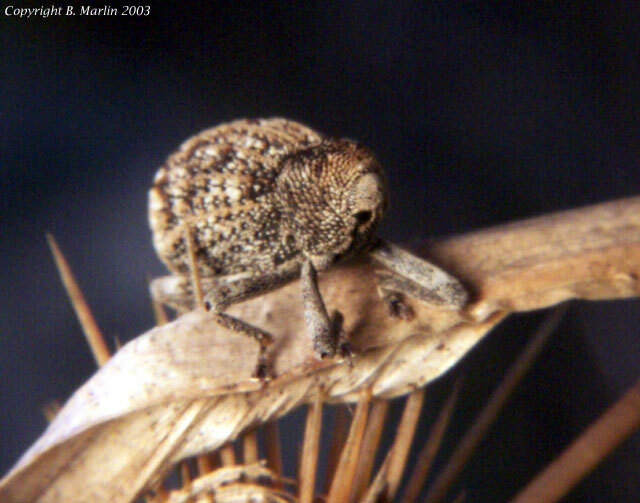 In the case of the acorn weevils, the snout can actually be longer than the body. Insects in the subfamily Rhynchitinae are commonly known as "tooth-nosed snout weevils." The weevil is sitting atop a clipped sunflower head. Read our article on the sunflower head-clipping weevil. Grub-like acorn weevil larvae hatch from eggs a few days after they are laid. There may be one to several acorn weevil larvae in each acorn. Larvae typically go through five growth stages, or instars. Each instar ends with the molt or shedding of the old skin, providing the larva with more room to grow. After a few weeks, larvae chew their way out of the acorn, burrow into the soil to pupate, and eventually emerge as adults the next year. Short-snouted larvae usually exit from a single hole that already exists in the acorn, but long-snouted larvae may chew their own exit hole through the acorn shell. Like larvae of the short-snouted acorn weevil, acorn moth larvae can feed only on damaged or sprouting acorns. The grayish female acorn moths lay eggs in damaged acorns, sometimes in the emergence holes of acorn weevil larvae. It's easy to distinguish the acorn moth larva, a caterpillar, from acorn weevil larvae. The acorn moth larva has three pairs of legs near the head and is generally longer than the legless, fat larvae of acorn weevils. Larvae of the acorn moth feed on acorns and probably on the fungi that often grow in damaged acorns. They usually pupate inside the acorns.